I have had the best time with my girls the past two weeks. As we await the finishing of our home in our little furnished apartment, we are finding we take more time to be together, do together. In all honesty, sometimes just to get out of the little furnished apartment, but none the less. 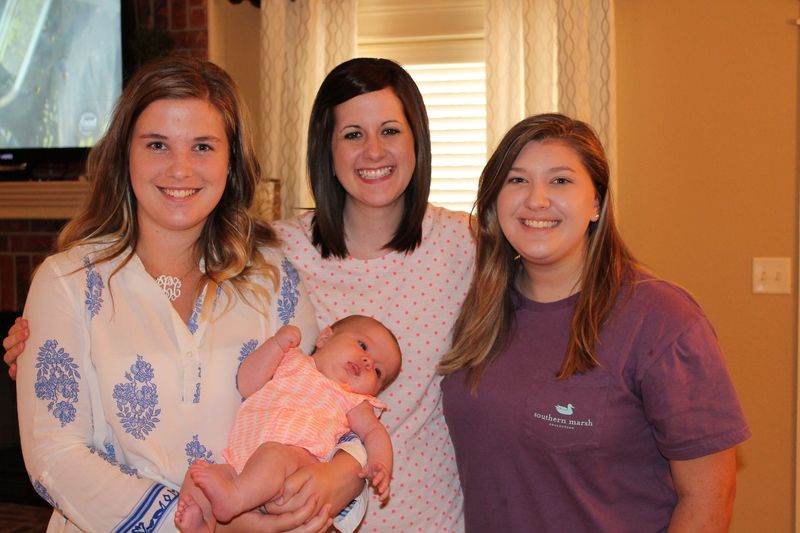 Last week we drove to the northern part of Arkansas to visit one of our favorite people and her precious new baby girl. For me, the trip was almost overwhelming. Many, many emotions surfaced, but the greatest of these was love. You see, this favorite person has been a part of lives since she was in 7th grade. Hard to believe and a part of the story that left me feeling a little overwhelmed about my age! My husband and I began working with the youth in our church shortly after we were married. I lucked out and got this incredible group of girls for 7th grade Sunday School. I was blessed to have them again in 9th grade! During this same time period my husband and I were going through infertility issues, the death of his mother, and health issues with my mother. All that to say, I wasn’t at my best every Sunday. But this incredible group of girls rallied around me and for every ounce of love I poured into them, they poured it right back on me seven-fold. We ALL learned a great deal about prayer and in many ways this group of girls was my accountability group. When I wanted to scream, when I wanted to give up on God and answered prayers, I knew I had to stay strong, hold to my faith and have hope. I owed it to this group of girls. You can rest assured the day I got to tell them I was not only pregnant, but pregnant with multiples we ALL cried. When the two precious twin daughters were delivered early on December 29, 1998 that group of girls beat everyone to the hospital. Within months, they were not only pouring love back into me, but they wrapped themselves like a little army around my precious miracles and held on tight. Two in particular, became a part of their families. And right along with them, came their siblings and parents. Together these two young girls, best of friends, became our “official” babysitters. Believe it or not, I left my two premature babies in their care at 4 months. They were only 14! I look back now and wonder what I was thinking! The truth is, I never doubted their abilities, their love for my girls. I knew deep in my heart special, life-long bonds would be formed. And that is exactly what happened. The picture above is one of those two precious, now young women. She is with my daughters and her three month old bundle of joy. We got to babysit for her. Even as I write this my eyes well up with tears, tears of joy. I’m not sure anyone else but us will really know all that picture holds. It is a picture of miracles. It is a picture of pure, unconditional love. It is a picture of what it means to pour into others, filling them, so they can in turn pour out into others. It is a picture of the mentoring cycle come full circle. It is a picture of what it means to be a Christian and to love like Christ. If you are a young mom I pray today you will consider expanding your circle to include a young babysitter or two. Trust. Have faith. Think more about the investment into relationships than the cost. If you are yearning for children and/or struggling with infertility, trust God to answer your prayers according to His will. And as you wait, love. Pour into someone or a group of someones. Don’t let Satan use your hurt, sorrow and struggles to squelch your ability to love and minister. I promise, when we pour out, God has a way of pouring it right back into us. And that is how we carry on. That is how we can face the sorrows and struggles still to come. That is how we handle the answers. It’s all about relationship. It’s all about loving others. I love the fact that babysitters we had watch our girls, (from our youth group), are beautiful women of God today!